I have been looking around an architecture for my backend services that needs to be developed using open source technology. A Node JS with Express is an option for REST-API. However, what about the middle tier between express controllers and Postgres SQL Server? 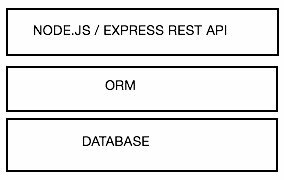 I am keen to make this middle tier as an ORM connecting with SQL The main question that I have in my mind is which ORM I should be using with NODE JS Express. I have been fiddling around various options, and everyone gives their own opinion with some limitation within. An ORM that support what RDMS has to offer. Good documentations and community support. At some point I will be using Memcached (http://memcached.org/) that it should be compatible with. What is your thoughts on your selection? It seems you have a lot of requirements. You can try pgo, which is a node.js postgresql dedicatd ORM. It doesn't meet all of your requirements, but you can evaluate it. Which ORM do you recommend to use with Node.js and PostgreSQL?